Syco is going to be releasing items based off the upcoming Far Cry 3 video game. 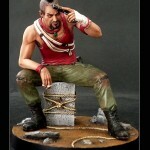 Their first statue will be the pirate leader Vaas Montenegro. The PVC statue stands at a bit over 6″. It is due out in October for $39.99. Click the headline of the story for some photos.